Comes packaged individually in a presentation box with tissue paper and a bauble care card. Makes a great keepsake or gift. Made from extremely lightweight Shatterproof Plastic with a glass style (looks like glass). 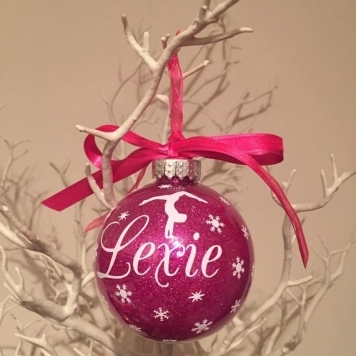 This listing is for 1 x Personalised Bauble which is Handmade to Order, specifically for you. Choose your options as noted below and then let me know in “message to seller” at checkout what you would like. If in doubt send me a message before you order and I will set up a custom listing for you. All of my baubles come packaged individually in a presentation box with tissue paper and a bauble care card. Makes a great keepsake or gift. Each bauble is a substantial in size at 80mm and is made from extremely lightweight Shatterproof Plastic with a glass style (looks like glass). I start with a clear bauble and you can add either glitter OR feathers inside (but not both).